We had a feast the other night. My pal, Eddie Accomando really dished up a swell one! We had real live, honest-to-goodness steaks, fresh off the fire, cooked to the taste of each individual concerned, as we went through the mess line. It was quite a job to put out steaks in that manner, but ‘twas wonderfully done. ‘Tis the first time that we have had them in our own mess since overseas. The meat was just right for steaks for a change and the boys had the inclination, sooo. Along with yonder steaks we had some swell French-frieds that were canned – they came that way and all that had to be done was to heat them up. Also had good lettuce salad, peas and peaches. Unfortunately, my spies had not been at work that day, and as a consequence I had foolishly eaten breakfast and lunch, and as a result only had room for 3 of those steaks that night. After supper I over-heard Eddie talking to one of the nurses who had been complimenting him on the good dinner. He told her that the bunch was awfully hard to please and he always figured that he was more than satisfied if two certain people were happy with any meal he cooked. He wouldn’t tell her who the two were, but I wonder who the other one is? My spies did alright today for they have already warned me of the chicken dinner coming tomorrow night. Real, whole chickens – not the canned stuff. Yum! Before I go further, and while I’m thinking of it, “HAPPY MOTHER’S DAY!! !” Consider yourself kissed, Mom. 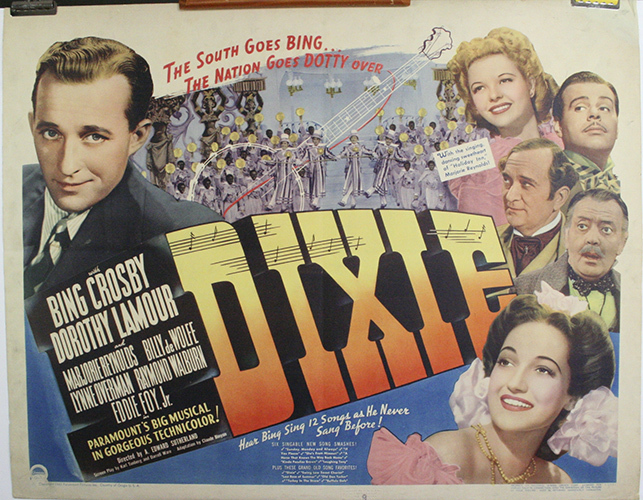 Saw Bing Crosby in “Dixie” last nite and ‘twas very good. You ought to see it. 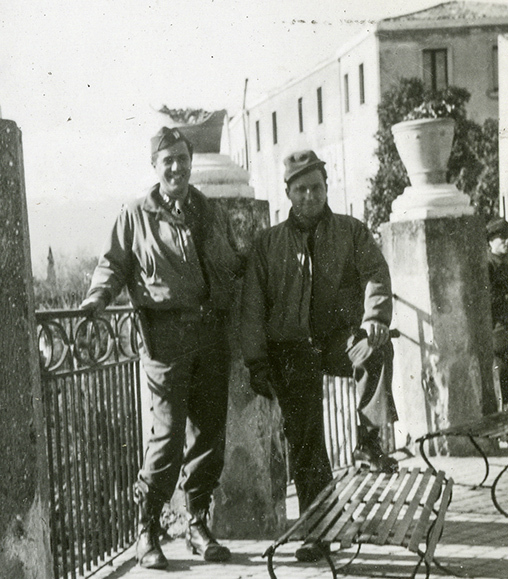 René with his “pal” Eddie Accomando – in Taormina – during their road trip around Sicily. René recommends that his parents see “Dixie” starring Bing Crosby.